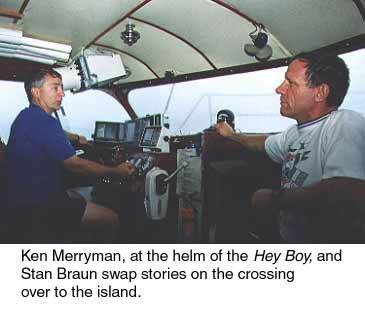 Captain Merryman has been boating on Lake Superior since 1973 and has been running scuba charters at Isle Royale and Western Lake Superior since 1976. He carries First Aid, CPR, DAN O2, and TDI Dive Master Certifications. 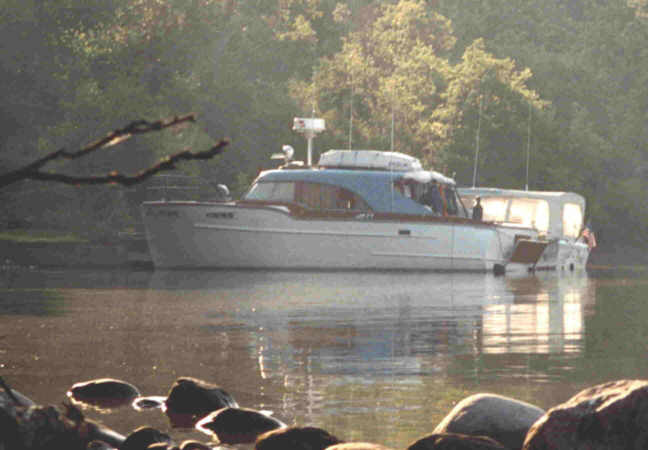 The Heyboy is a 33 foot Owens Cruiser which is inspected regularly by professional surveyors. For navigation and operation it is equipped with radar, Waas Differential GPS w/charts, Lorance and Garmin Side Scan & Down Scan, Weather Maps, 2 - VHF radiotelephones, depth sounders, and a compass. It is also equipped with a 3000 psi compressor, oxygen resuscitator, AED, in-water O2 for safety stops, a continuous flow nitrox blending station, and other equipment necessary to support safe wreck diving. Conveniences include a 110 VAC 4kw generator, 2kw inverter, stereo & TV/VCR, refrigerator, propane galley, microwave oven, and of course a marine head (toilet). You can expect clean well maintained accommodations and delicious meals. We specialize in good home style cooking and a charcoal grilled dinner meal. Sleeping accommodations are cozy but comfortable.